Maggie Pill Mysteries: Release Day...What Did I Forget? 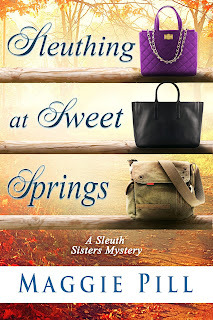 Of course you know by now that the 4th Sleuth Sisters Mystery releases today. If you don't, I'm not sure what I could have done differently. I'm featured on a book lover's site. I delivered early copies to Tom's so the locals can have first looks. I sent out postcards to libraries and bookstores. All you have to do is enjoy the book...unless you're willing to write a review somewhere.